With general elections 2019 round the corner, the government looks set to go on a spending spree, offering freebies and sops. This may include direct benefit transfer to farmers, more expenditure on roads and railways, enhanced minimum support price (including the cost of land element), interest free crop loans, capitalisation of banks, and more benefits for smaller food-processing units. Along with this, the plan is to extend benefits to the middle-class via tax breaks in direct tax, and extending benefits for home loan interest exception from Rs 2 lakh to Rs 3 lakh. This requires more money, better management of funds and liquidity in the system. The government needs courage to open the purse strings at a time when it is struggling to match the revenue projections for the ongoing financial year. All these sops could be part of the interim budget the finance minister Arun Jaitley will present in Parliament on February 1. FM’s party colleagues, BJP and RSS, aligned think tanks and even economists at NITI Aayog have suggested that the government should not bother if fiscal deficit widens slightly. A slippage of 10 basis points from the targeted 3.3 per cent can give the government some flexibility to plan additional expenditure of nearly Rs 24,000 crore. This alone will be good enough to fund the crop loan interest subvention scheme, where the government is planning to waive off existing 4 per cent interest on Rs 1 lakh crop loan. The plan is to stretch it further. FM’s colleagues in the party have suggested taking a deviation of up to 25 bps. Meanwhile, the government is in a rush to clear as many bottlenecks as it can in the run up to general election. This includes easing the access to capital for NBFCs, clearing the stuck road projects, convincing banks to fund road projects, and bringing more road and renewable energy projects on ground. It has also eased the credit flow among MSMEs and has implemented new e-commerce regulations along with bringing in constitutional amendment to provide 10 per cent reservation to those in the economically weaker among general category. BJP believes that an expansionary budget will help the party’s prospects as well as the economy. Considering BJP’s rout in the three state assembly elections in December, the suggestion is to open up coffers to dispel the symptoms of anti-incumbency. The thinktanks aligned with BJP, their ideological parent RSS and economists at NITI Aayog suggest keeping an eye on the revenue deficit. “The expansion should not be done to fund the wasteful expenditure. It should be spent judiciously,” a top leader from the BJP told Business Today. Just a day before leaving for the US, FM Jaitley patted the back of his government for maintaining fiscal discipline during the past five years. 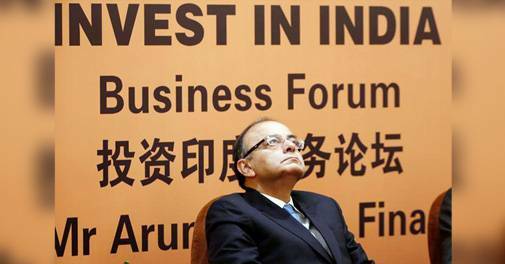 Jaitley is in the US for his health check up, and is expected to come back before the Republic Day. In his absence, PMO, along with officials at Finance Ministry and NITI Aayog, are fine-tuning the budget details. In the previous budget, Jaitley expected the fiscal deficit at Rs 6,24,276 crore, while planning expenditure of Rs 29,20,484 crore (nearly 3.3 per cent of GDP). Most experts do not expect him to achieve this target. His colleagues in the party, however, expressed that there is no reason to consider fiscal deficit at 3.3 per cent of GDP as “sacrosanct”. They added that we are not asking for a splurge of funds, but there is no need to stick to a number. This fiscal, the government is finding it difficult to match the revenue targets with flickering numbers of GST collections, not so encouraging disinvestments and poor response to telecom spectrum auction plans. 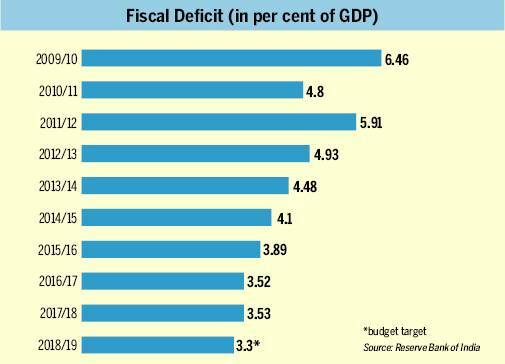 Amid this, the fiscal deficit is expected to breach the target of 3.3 per cent of GDP by 10 bps. By March, the exchequer is expected to get the additional funds of Rs 40,000 crore from the Reserve Bank of India (RBI) as dividends. This might allow government to keep up with the targeted numbers. The decision of Bimal Jalan-led committee on transfer of RBI’s surplus is not expected before March, so the government has given up on these extra bucks. This means, the capital infusion in public sector banks — before they head for BASEL-3 norms and IFRS accounting — would have to be provisioned in the budget itself. In the last four years, the government has pumped in money in the infrastructure sector to kick-start the demand, but the rural duress and subsequent weaker consumer spending is a drag on the economy. Government sees this ‘expansionary budget’ as move to speed up the demand cycle. The officials also expect that in the first week of February, when the monetary policy committee of RBI will sit, they will consider the rate cuts. “This will also help in pushing the demand,” the official remarked. Meanwhile, on December 17, various industry lobby groups met with the RBI Governor Shaktikanta Das, and asked him to consider the reduction in the repo rate and CRR. They reasoned that this would help in reviving the investment cycle in the country and will also boost consumption and support growth. “The need of the hour is to have an accommodative monetary policy, focusing on growth. The objectives of the Monetary Policy Committee should not be restricted to only price stability but should also consider growth and exchange rate stability,” said Sandip Somany, President, FICCI. There are other indications, coming in from the PMO and Finance Ministry, which suggest that the forthcoming budget will not be a mere vote on account, or interim budget. This could be a walk-away from the precedent of keeping the final budget of the government as vote on account. The convention is that the finance ministers take this opportunity to present the intent of the government. In 1991, Yashwant Sinha famously presented the intent for disinvestment and probable liberalisation. In 2004, Jaswant Singh, and later in 2009 and then in 2014, P Chidambaram followed the norm. In fact, Chidambaram’s last budget had sops and excise duty cuts, when the party intended to make for the loss of popularity. Sources said since the budget is now presented on February 1 and not by end of March, the vote on account would not make any sense. “The governments work in continuity, you can’t hold the finances for the departments for the first full quarter,” one of the sources explained. We can only hope that not all is for votes, but they are indeed putting the money where it is required.